Active sensors are incorporated into a number of technologies, such as meteorology devices and self-driving cars, and use the echo from sound, radio or light waves to locate objects. But despite nearly a century of development, these active sensing technologies still fail to replicate the performance of sonars (sound waves) used in the biological world by dolphins and bats for echolocation. To find ways to improve man-made active sensing, scientists worldwide study the sonar systems of bats and dolphins. During the Acoustical Society of America's 176th Meeting, held in conjunction with the Canadian Acoustical Association's 2018 Acoustics Week, Nov. 5-9, at the Victoria Conference Centre in Victoria, Canada, Laura Kloepper, assistant professor at Saint Mary's College in Notre Dame, Indiana, will compare bat and dolphin sonar systems, describing her work on how the two animals cope with acoustic interference. She'll use her findings to argue why bats have the superior system. "I'm on Team Bat," said Kloepper. "But I'm going to be presenting dolphin work to argue why bats are better." She hopes her talk sparks a healthy debate between researchers of both animals. Kloepper's talk is part of a special session devoted to bat and dolphin sonar systems. Several of the speakers in the session will appear in a press conference devoted to the subject. Scientists have long been puzzled by how groups of bats and groups of dolphins distinguish their individual echoes from others within their colony or pod. Laboratory studies have suggested a number of potential bat strategies to overcome this acoustic interference or jamming. "I'm going to be presenting the first study looking at how dolphins might be changing their signals to avoid jamming, or if they are even subject to any sort of acoustic jamming," said Kloepper. Kloepper introduced dolphin clicking through a specialized setup of speakers and microphones at U.S. Naval facilities, to interfere with the echolocation of a single dolphin performing a behavioral task. "We were excited to see that when playing this stimulus we see a response," said Kloepper. "But they don't have the same level of control of their call as bats do." She thinks that this difference in control is related to the level of complexity in the sounds the animals use to echolocate. "The probability of overlapping one call with another dolphin isn't high, because the clicks are so short, therefore dolphins don't really have a need to change to avoid any sort of acoustic interference," said Kloepper. "Bats, on other hand, have calls that are much longer in duration, so have a higher probability of overlapping with other bats when they are flying in the same airspace." 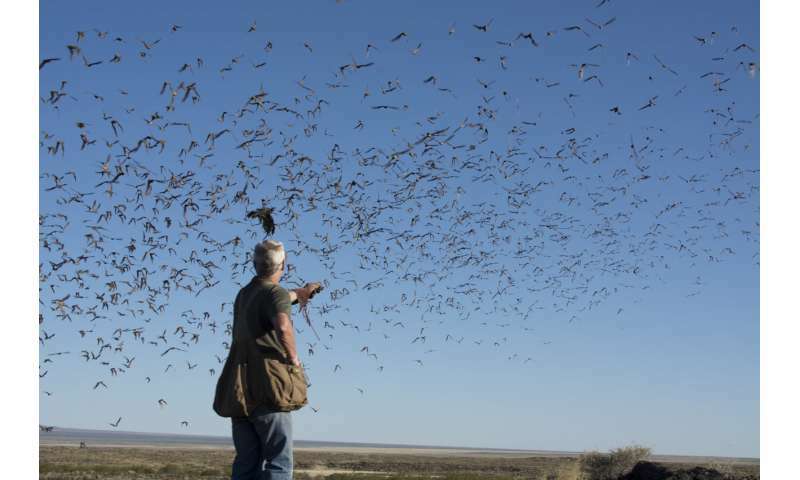 In her bat studies, Kloepper mounted cameras and microphones onto various mobile platforms, including a hawk trained to fly through, what she describes as "this incredible dark river of bats in the sky"—the bat swarm. These studies and others have revealed that a number of bat species alter how the pitch changes over call duration; these bat species are referred to as frequency-modulating. "They have the ability to be really flexible with their echolocation, which is how they can overcome this jamming," said Kloepper. Kloepper's team is comparing videoed behavior of bats with acoustic detail to answer questions such as what sounds are produced by bats in different positions in the swarm. They've managed to acquire some group behavioral information, but the challenge now is to address individual level detail. 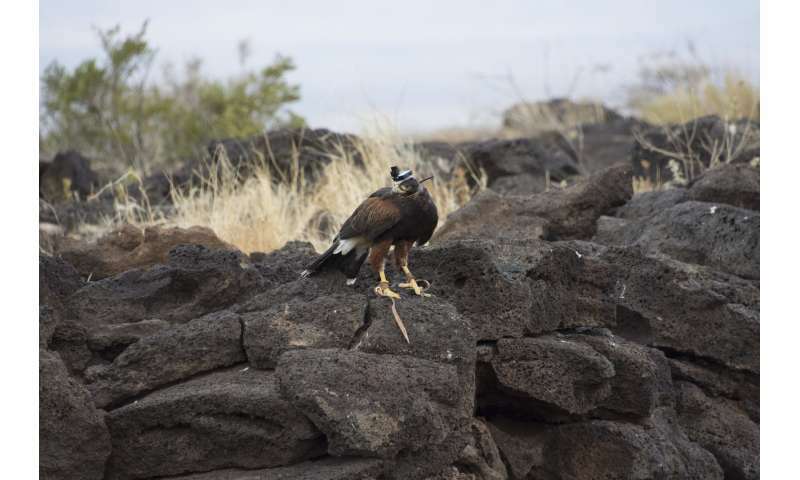 "We're currently developing new electronic hardware to go on our drone and hawk that will allow us to really home in on which bat is making which call when it's in the middle of this massive group," said Kloepper. As for dolphins, Kloepper wants to expand their pilot study. "We want to find out how they respond if we give even more interference—will they be able to echolocate?"